The very basics of human rights and privacy rights don’t apply here any more. We now live in a world in which your social media profile is becoming more important than a passport. What will happen if you don’t have a Facebook account at all, or not even a smart phone? What asylum seekers will soon have to endure in Germany is already, in a softer form, being implemented for everyone traveling to the Unites States and other countries. The border search exception empowers customs and border protection agents to search any electronic device. Increasingly, customs officers are asking travelers to show their social media profiles, passwords and to unlock their phones. In the future this process could be, very plausibly, automated at the entry-points and borders of many countries. 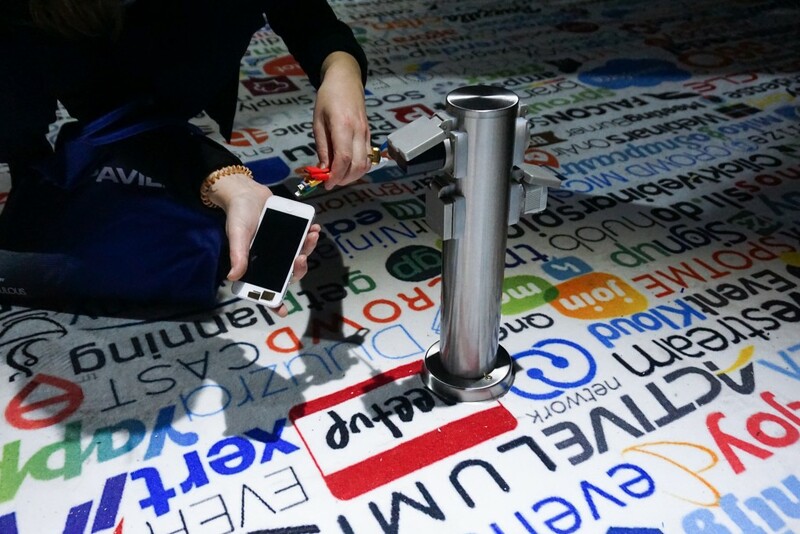 Social media is the perfect tool for commercial data mining and user tracking for marketing companies. And it also perfectly serves a governmental total control scenario, which is not some far-off, futuristic idea but a reality that is unfolding right now. 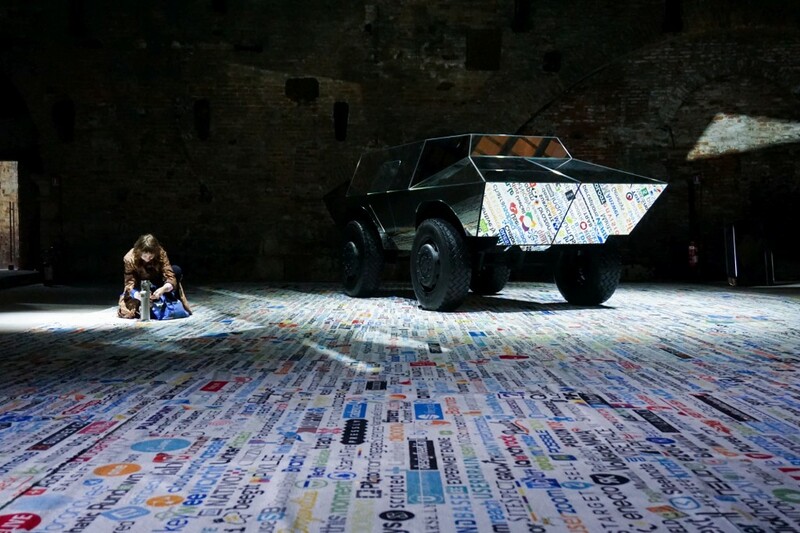 The installation/performance WannaCry (Weeping Angels) plays out on an 8×14 meter carpet printed with logos of more than 3000 internet marketing and user tracking companies. 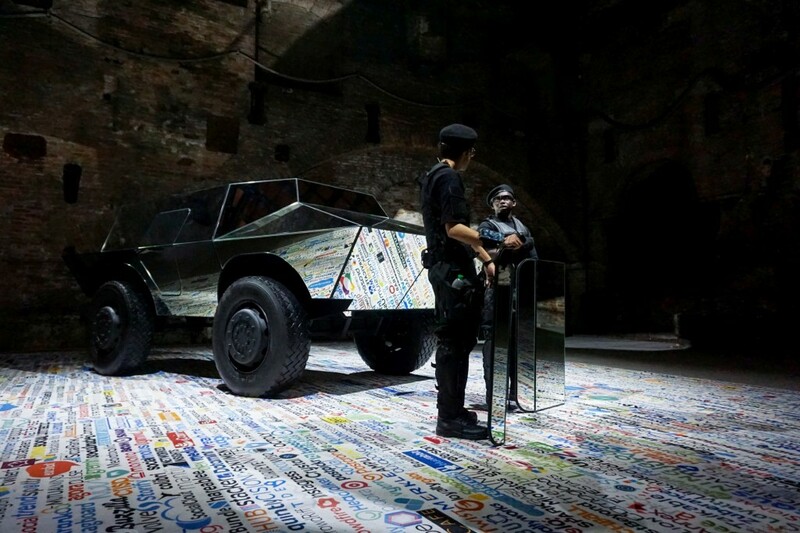 On the carpet, a mirror-covered, disguised, anti-riot police tank is parked. 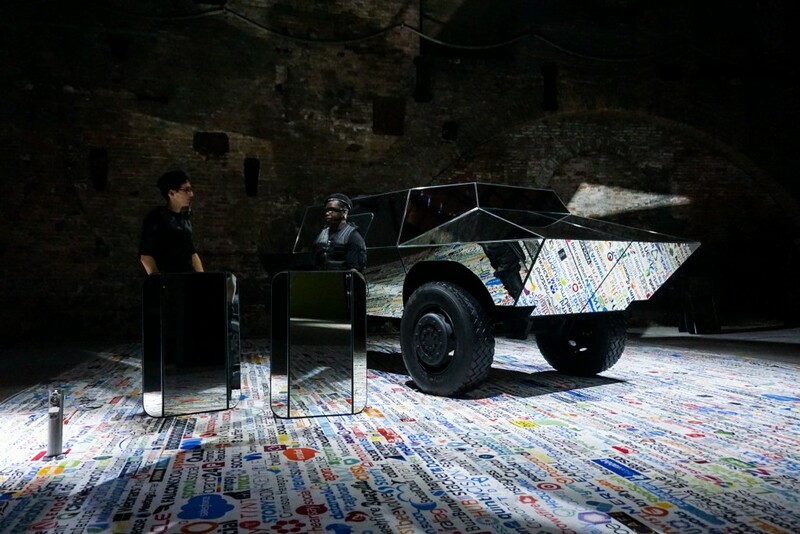 Specially-equipped security guards holding mirrored shields patrol the exhibition space and ask the visitors for their smart phone and social media profile. With conversations like this, the guards cover up the fact that they are actually checking visitors’ phones (in the sense of the performance only; no data is collected). 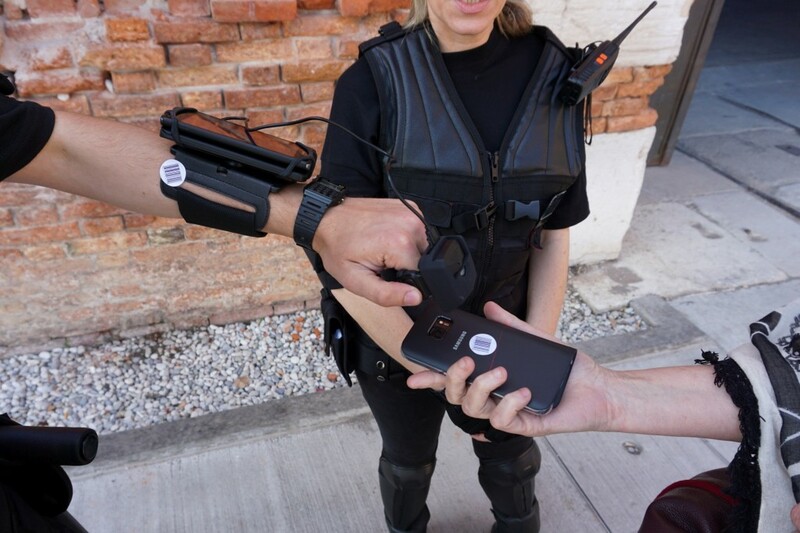 Barcodes are stuck on visitors’ phones, which are then scanned by the special unit officer. 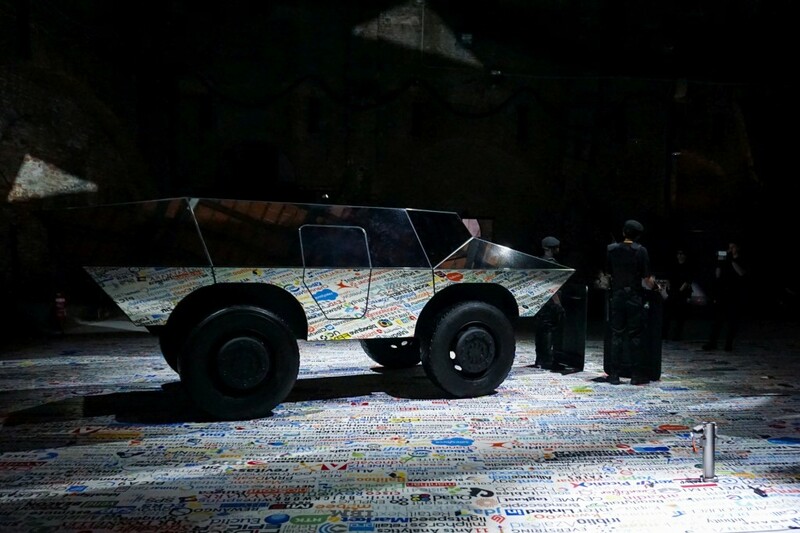 Visitors are left unsettled and wondering whether the encounter was real or part of the installation. 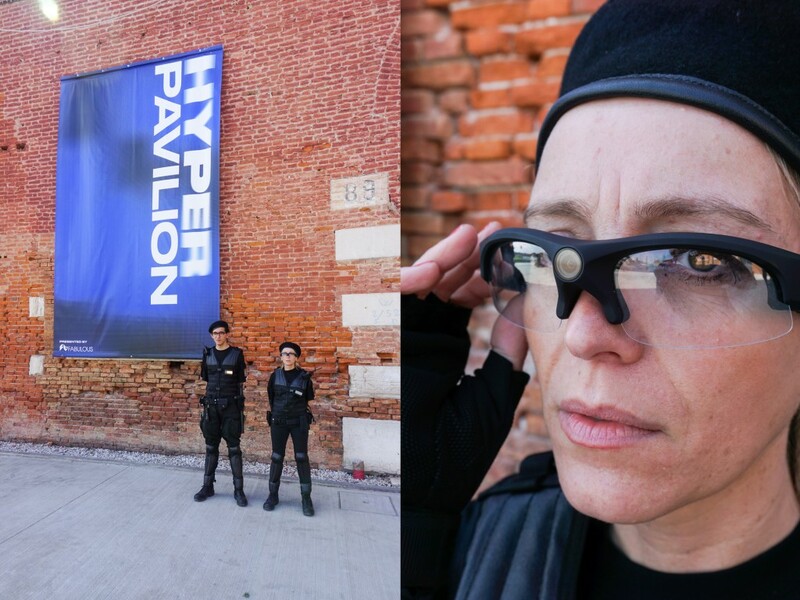 In the context of the heavily patrolled Venice Biennale and the presence of actual armed soldiers in the Giardini, this performance works very well. The guards are present every weekend for the whole show until the end of October, 2017. 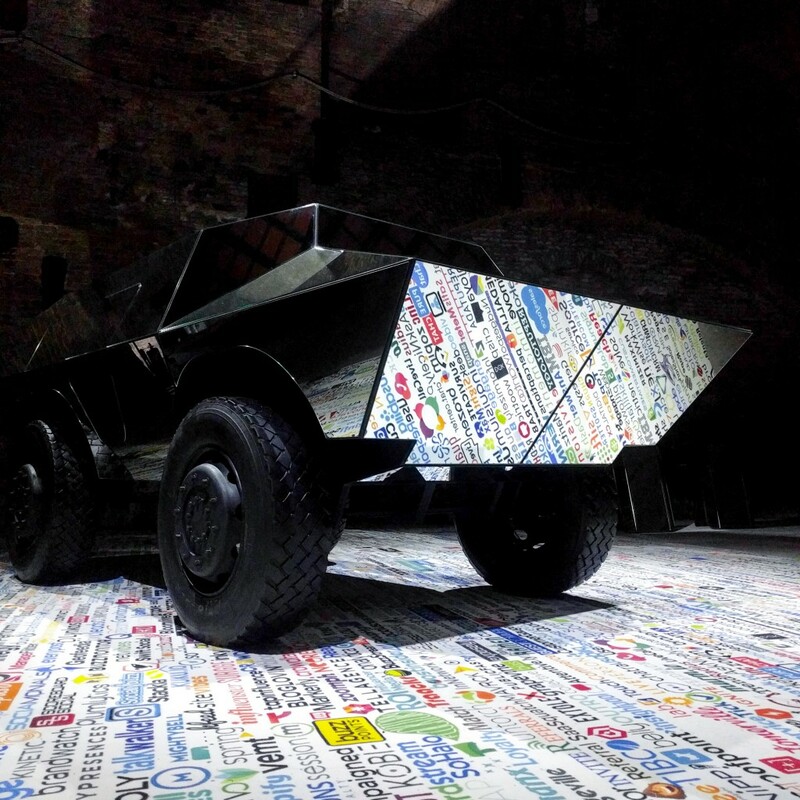 This new installation/performance produced for the Hyperpavilion Venice was inaugurated on May 11th 2017 just one day before the break out of the ransomeware virus WannaCry which led to widespread computer failures across the world. Such an uncanny correlation left me little choice but to rename the piece (formerly: Weeping Angels) with the name of the virus. WannaCry (Weeping Angels) evokes a dark age that we are on the cusp of entering: ever-increasing surveillance, terror attack fear and cyber-war panic on a daily basis. While we chill on our fluffy carpet at home thousands of companies retrieve and process our personal data. Increasingly military-like police control the cities while government intelligence collects massive amounts of data unnoticed every day. Is it 1984 yet?